Paradise found! Situated in the peaceful town of Phelps, enjoy the serenity the location this beautiful home provides. The 4,500+ square foot home features 5 bedrooms with gorgeous views of the lake from each. 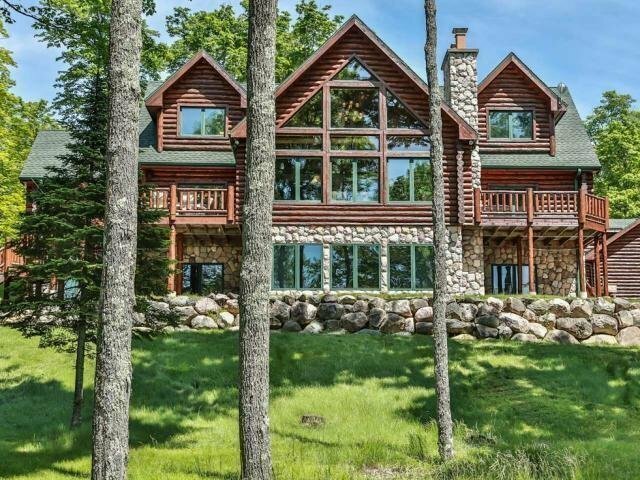 The 2001 custom built log home boasts a lodge-like feel with floor to ceiling windows, toasty stone fireplace, chef's kitchen,and sunroom all on the main floor. The walk out lower level is equally as comfortable and rounded out with a family room with the second fireplace, 2 bedrooms, sauna, and storage room for all your extra toys. Not to mention the 3-car garage with additional upstairs storage. All this is sitting on 9+ acres and 250' of frontage on premiere 1,400 acre Big Sand Lake, with deeded access to 886-acre Long lake. All the creatures comfort you could ask for are here (including high speed internet, make an appointment to view today!